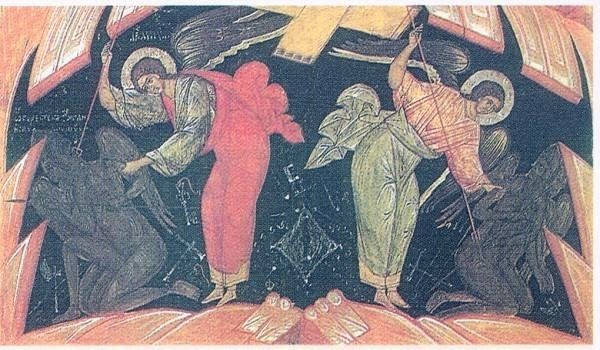 He who from among the angelic powers was set over the earthly realm, and into whose hands God committed the guardianship of the earth, was not made wicked in nature but was good, and made for good ends, and received from his Creator no trace whatever of evil in himself. But he did not sustain the brightness and the honor which the Creator had bestowed on him, and of his free choice was changed from what was in harmony to what was at variance with his nature, and became roused against God Who created him, and determined to rise in rebellion against Him: and he was the first to depart from good and become evil. For evil is nothing else than absence of goodness, just as darkness also is absence of light. For goodness is the light of the nous, and, similarly, evil is the darkness of the nous. Light, therefore, being the work of the Creator and being made good ("For God saw all that He made, and behold they were exceeding good." - Genesis 1:31) produced darkness at his free-will. But along with him an innumerable host of angels subject to him were torn away and followed him and shared in his fall. Wherefore, being of the same nature as the angels, they became wicked, turning away at their own free choice from good to evil. Hence they have no power or strength against any one except what God in His dispensation has conceded to them, as for instance, against Job (Job 1:12) and those swine that are mentioned in the Gospels (Mark 5:13). But when God has made the concession they do prevail, and are changed and transformed into any form whatever in which they wish to appear. Of the future both the angels of God and the demons are alike ignorant: yet they make predictions. God reveals the future to the angels and commands them to prophesy, and so what they say comes to pass. But the demons also make predictions, sometimes because they see what is happening at a distance, and sometimes merely making guesses: hence much that they say is false and they should not be believed, even although they do often, in the way we have said, tell what is true. Besides they know the Scriptures. All wickedness, then, and all impure passions are the work of their mind. But while the liberty to attack man has been granted to them, they have not the strength to over-master any one: for we have it in our power to receive or not to receive the attack. Wherefore there has been prepared for the devil and his demons, and those who follow him, fire unquenchable and everlasting punishment (Matthew 25:41). Note, further, that what in the case of man is death is a fall in the case of angels. For after the fall there is no possibility of repentance for them, just as after death there is for men no repentance.